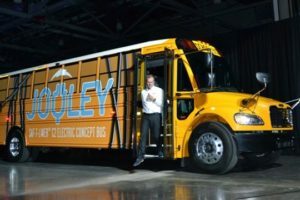 Thomas Built Reveals New Electric School Bus | Sonny Merryman Inc.
Thomas Built CEO Caley Edgerly surprises conference attendees by pulling up in a new electric school bus, dubbed Jouley. Photo courtesy of SchoolBusFleet.com. COLUMBUS, Ohio: Thomas Built Buses unveiled a new electric school bus at the National Association for Pupil Transportation (NAPT) conference here on Saturday. Thomas Built President and CEO Caley Edgerly surprised attendees by driving an electric Saf-T-Liner C2 model, dubbed Jouley, into a large exhibit hall during a Saturday afternoon session. The electric bus runs on an Efficient Drivetrains Inc. PowerDrive 7000EV powertrain and has an approximate range of 100 miles. Edgerly said that he foresees Jouley going into early production in 2019. Also, the electric bus is expected to significantly reduce operational costs for fueling and maintenance. Jouley is named after the joule, a unit of energy. The bus provides 100 to 160 kWh of battery energy, with up to 100 miles between charges and an option for higher range with additional battery packs. According to Thomas Built Buses, Jouely has quiet operations, zero emissions, and exportable power. Students riding the bus will be able to charge their computers and other devices directly from the vehicle. Other Jouley features include PowerSuite vehicle control software and the PowerTracker telematics and diagnostics system, which tracks bus location and provides real-time monitoring of potential issues. More information on the electric Saf-T-Liner C2 model can be found on the Thomas website.